Join us for an immersive, festival style production of Shakespeare’s wondrous comedic tale of lovers and their demise. Fire up your Halloween spirit with a mystical evening of dark fairies, music, dancing, food trucks, beverages and enchanting pre-show entertainment sure to satisfy your cravings for the dark and mysterious. 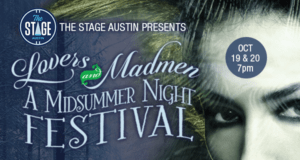 Two nights only October 19th and 20th 2018 at St. Martin’s Lutheran Church in downtown Austin. General admission and VIP tickets available. Doors and grounds open at 7pm and show begins at 8pm.